With summer now in full swing, Canadians are finally taking their fitness resolutions seriously and seeking out the latest fitness craze. So in honour of beach season, we’ve rounded up the hottest fitness trends that are picking up steam this summer. From in-office yoga to streaming boutique fitness classes, these movements need to be at the top of your workout bucket list. 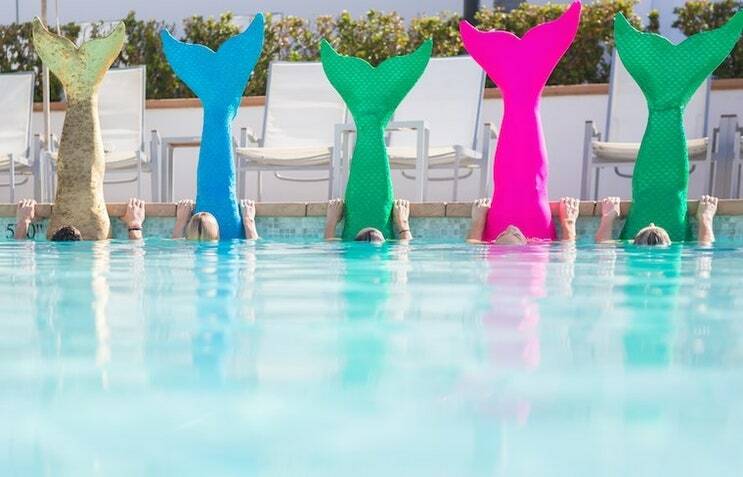 Ditch the sneakers and traditional exercise gear and make your way to the water, as your childhood dreams of becoming a mermaid are about to come to life with this fitness trend. It combines circuit training and ab workouts while wearing a glittery mermaid flipper. The 45-minute, adults-only class takes place in the shallow end of a pool and includes swimming laps to get your heart rate up, and standing stationary movements like squats and arm exercises with a beach ball. The flippers are made with a lightweight bathing suit material and even come in men’s’ sizes as well. Ariel approved. Boutique spinning classes are becoming notoriously expensive, often costing $50 and up for a drop-in. Which is why celebrity trainer Anna Kaiser now offers a streaming membership program that gives members access to all of her workouts for $50 a month. Streaming allows users to change up their workouts, allowing for more variety than a DVD. We all loved obstacle courses as kids – competing against your friends and racing against the clock – which is why we’re excited to see them making a comeback. Here in Toronto, you can find a number of indoor and outdoor obstacle courses gaining popularity. Pursuit OCR is a great option, offerering a jungle gym combined with an obstacle course-style race. Obstacle courses encourage teamwork and camaraderie and motivates clients, makes fitness fun, and produces results. Travelling can often spiral into overindulgence, with fitness goals put on hold. Luckily more hotels are beginning to offer amenities to help travellers stay healthy while they’re on the road. Fairmont Hotels now offers Fairmont Fit, which provides guests with workout apparel, footwear, and a yoga mat with stretch band. Hyatt Hotels, meanwhile, has launched its Be Well program that offers curated in-room amenities, increased fitness offerings, expanded menu options, and nutritious to-go alternatives to maintain healthy habits on the road. Anyone who’s ever surfed before can attest to how hard it is and how much strength and balance it requires. Surfset Toronto uses surfing techniques and targeted movements to get a workout similar to what you would from surfing, which makes it a killer activity and one that needs to be added to your repertoire this summer. Young professionals spend far too many hours confined to their desks (us included), which is why we’re excited that in-office workouts are gaining popularity as they combat sitting disease without actually getting up. Toronto’s UTKATA features 30-minute sessions that do not require a mat or a change of clothes and are specifically designed to bring peace and tranquility to the hectic office environment. Fitting in a short workout during your busy schedule will boost your mood, enhance focus, stimulate brain function, and increase productivity. Step up your traditional yoga workout and try an aerial yoga class at Toronto’s Fly Studio. Here you’ll use a silk rope suspended from the ceiling and complete exercises that focus on core strength and flexibility training that can be done in the air and on the mat. Members will use the silks to stretch out their bodies and loosen up their muscles in a fun and playful way.